We now enter the last two episodes of our series on the 100 days, the final Allied offensives of the war. Today we will be looking at the allied offensive effort which began in late September and which would run, with few breaks until the end of the war. 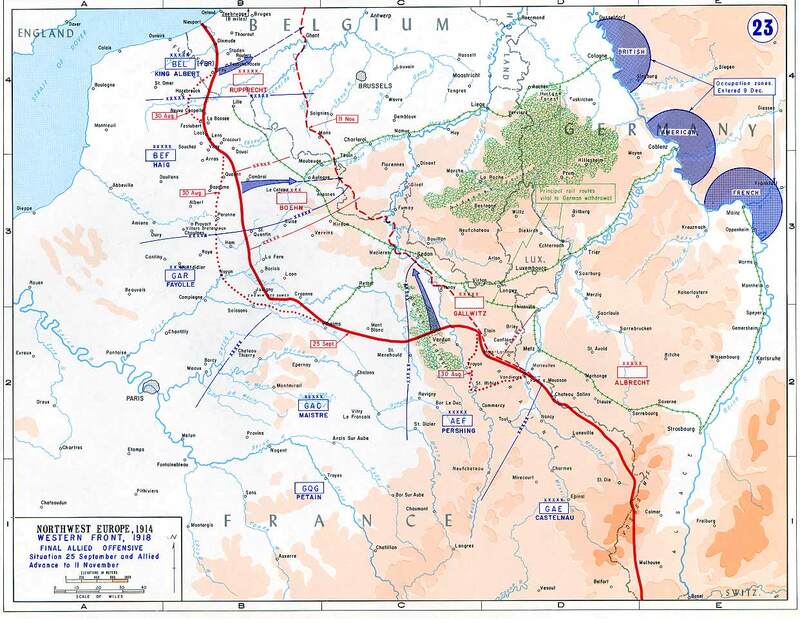 During this tie the British, French, and Americans would be attacking directly into the much hyped Hindenburg Line. The sheer scale of the fighting, with the entire front from Flanders down to the Argonne seeing attacks, would result in casualty figures that were higher than the massive positional battles of 1916 and 1917, but these would actually see territory changing hands. These attacks would see a different type of warfare, not seen since the early days of 1914, with the battlefield becoming far more open and fluid, forcing the participants to adapt to the new conditions. In these new conditions the material superiority of the Allied armies would really begin to alter the balance of the fighting, and the German army would continue its downward trend. We now enter the last two episodes of our series on the 100 days, the final Allied offensives of the war. Today we will be looking at the allied offensive effort which began in late September and which would run, with few breaks until the end of the war. 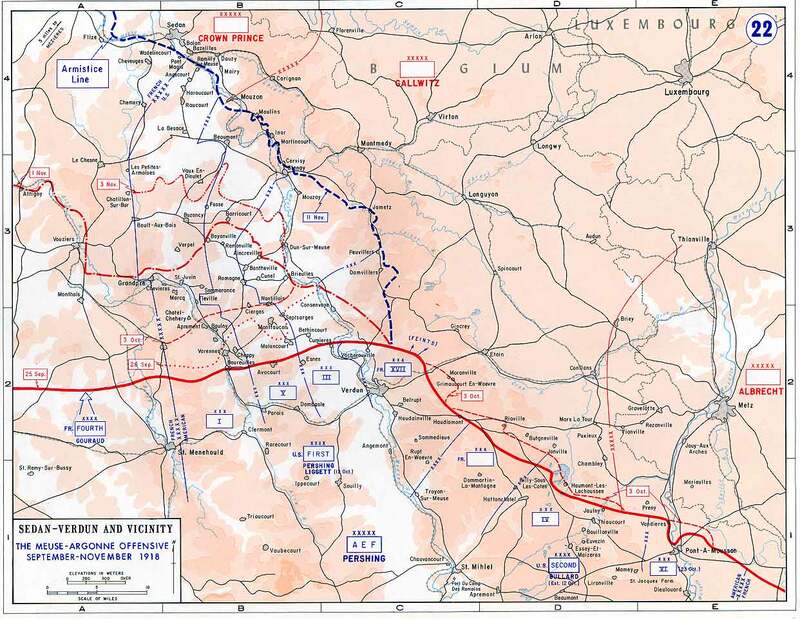 During this tie the British, French, and Americans would be attacking directly into the much hyped Hindenburg Line. The sheer scale of the fighting, with the entire front from Flanders down to the Argonne seeing attacks, would result in casualty figures that were higher than the massive positional battles of 1916 and 1917, but these would actually see territory changing hands. These attacks would see a different type of warfare, not seen since the early days of 1914, with the battlefield becoming far more open and fluid, forcing the participants to adapt to the new conditions. In these new conditions the material superiority of the Allied armies would really begin to alter the balance of the fighting, and the German army would continue its downward trend. I think it is appropriate to begin these episodes with a quote from a British sergeant who would take part in the British actions in Flanders during these months, he was an old hand with a lot of experience, and he compared the German troops of 1918 to those earlier battles “I have seen prisoners coming from the Battle of the Somme, Mons and Messines and along the road to Menin. Then they had an expression of hard defiance on their faces; their eyes were saying: ‘You’ve had the better of me; but there are many others like me still to carry on the fight, and in the end we shall crush you.’ Now their soldiers are no more than a pitiful crowd. Exhaustion of the spirit which always accompanies exhaustion of the body. They are marked with the sign of the defeated.” October and November 1918 would be a very long 6 weeks for the German army, but at least the war would be over soon. The plans for the final offensives would begin in early September when Foch laid out his plans for the army leaders. Foch has been pushing for an offensive along the entire Allied front since the Marne, but now it would finally be possible. In the Meuse-Argonne sector the Americans and French would attack on September 26th, an attack that we covered quite thoroughly in previous episodes. To their north and west the French would continue their attacks between Soisson and Reims. To their left the British would attack into the heart of the Hindenburg line and try to push towards Douai and Cambrai on September 27th, with their first obstacle being the Canal du Nord. In Flanders the British and French troops would attack on September 28th, and for the first time during the war they would be joined by the Belgian army in an offensive operation. The final offensive would be against the Saint-Quentin canal where the French and British would combine forces to push across one of the strongest pieces of the German defenses. It was hoped that these blows, falling one after another after another would cause the Germans to be simply overwhelmed. There were huge expectations for these efforts, but even with them it was still expected that the war would go into 1919, even in late September the goal of these attacks was simply to get the Germans out of the Hindenburg line and to gain some territory, with everyone expecting the Germans to make it to winter at which point they would be able to hold out until Spring. Haig would be one of the leaders who had already shifted his thinking to a belief that they would end the war in 1918, but I am not sure if he should be seen as some kind of luminary or if he was just lucky that in this case his optimism would turn out to be correct. As we will discuss next episode, towards the end of the attack the Allies were wearing out, and they were going to enter into a period where they really could not continue the attack due to exhaustion, so it is understandable why many people did not think that they would be able to continue the attack far enough to end the war. It would only be the complete collapse of the German army and society that would hostilities to end so quickly. All of that is in the future though, and for the moment, in late September 1918, the Allies were about to launch their greatest offensive operation of the war. There would be 123 Allied divisions used in the attack, with 57 more in reserve. On paper they were facing a roughly equal number of German divisions, but many of those were mere skeletons of their former selves. I have organized this episode so that we will cover the attacks in chronological order based on when they started, but it is generally best to continue them as sort of one single effort since they happened so close together, with only a day separating each one. We have discussed the Meuse-Argonne operation in good detail in the last few episodes, but just a brief overview is required here just for completeness. When the attack started on September 26 they went quite poorly, there were a few good advances, but many of the important parts of the attack were complete failures. Over the next several days they would attack again and again and slowly grind their way forward, but by the 29th the Americans had to call a halt. When they stopped they had just reached the Kriemhilde Stellung, the primary set of the German defenses in the area, and any resumption of the attack would mean that they would have to take those defenses. The entire situation greatly frustrated Foch and the French commanders in the area, who had by and large performed much better than the Americans. In their first major attack against German resistance the Americans were not exactly showing themselves to be a good as they had wanted to believe. In the north the attacks against the Canal du Nord would be spearheaded by the Canadians, although there would also be two entire British armies, the first and third, involved as well. The canal itself was a tough nut to crack, with west bank, where the Canadians would start, was 10 to 12 feet high and the canal was 100 feet wide. On the other side they would then be faced with the eastern bank which rose 5 feet. Trying to attack across such an obstacle, with the number of troops required, would have been almost impossible. There was one other option though, a small piece of the canal that was dry because of construction which had not been finished. It was only 2,600 yards wide, which did not give a lot of room to maneuver, but it seemed like the best options. Just to give an idea of now narrow this was, the Canadian Corps would be attacking across it, with two divisions first, then another 2 divisions directly behind. These divisions would normally occupy about 10 times more front, 30,000 yards. If the front of these units got stuck or bogged down it would have been disastrous. General Currie, the commander of the Canadians, believed that it was worth the risk, and when the attack began at 5:20AM on the 27th the artillery appeared to be up to the task. Canadian Private Guy Mills would say "It was just like a furnace door opening, there was nothing but guns, you couldn't hear anything else but guns. You couldn't hear yourself shout." There was little that the German defenders could do when faced with such fire, and then the extreme numerical superiority of the Canadians. Within 12 hours they had advanced 5 miles and by the end of the first day they had advanced a total of 6 miles on a front that was now 12 miles wide, all while taking 16,000 prisoners. On the right the British Third Army had attacked directly into the German Hindenburg Line positions, and they would not make it all the way through, but they did push into the defenses and cause serious German casualties. This does not seem like a great success, but it also exactly what the British expected here, this alignment of expectations and reality was important because it allowed the British to be completely prepared to continue the attacks the next day, instead of scrabbling to meet over optimistic objectives from the first day. The next blow would come in Flanders. Here the British and French had gained the support of the Belgians, who for the entire war had stood on the defensive. They gained this support by naming the Belgian king, Albert, as the leader of the Northern Army Group, he would have a French Chief of Staff, General Degoutte, but the king would technically be in command. He would be leading French, Belgian, and British divisions in the attack, and their goal was to drive east from Ypres and the surrounding areas to capture Passchendaele ridge, good old Passchendaele. The situation in 1918 was very different than what it had been in 1917 and the German defenders would be heavily outnumbered, and most important most of their reserves had been sent south during the previous months. This prevented the rush of reserves to the area that had stabilized the front in 1917. When the attacks began on the 28th they started with success, even though there was once again rain, and even though they were attacking over the same churned up ground that had been the site of the 1917 battles, and even though the Germans were completely aware that the attack would soon begin, the allies were successful. On the first day they would advance up to 8 miles, with the village of Passchendaele, or what was left of it, being captured by the Belgian troops. The next day the attacks would continue, along the with the rain. This reduced the speed of the advances, due to the problems of moving men, supplies, and artillery forward. Instead of continuing to struggle forward in these conditions the attacks would instead be halted just a few days later on October 2nd, it would be two weeks before they began again, after the ground had dried and the situation on the rest of the front continued to develop. While we have spent so much time discussing the Western Front, and it was the primary point of focus in 1918, there were event elsewhere in Europe that would also affect the situation in the West. In the middle of September the Allied troops that had been stationed at Salonika since 1915 began an offensive, pushing north against the Bulgarians. For two weeks the Allies advanced just about as fast as their feet could carry them as the Bulgarian troops just melted away in front of them. Whole units of the Bulgarian army mutinied and spontaneously moved towards rail lines that they hoped could take them home. Due to the complete collapse of the army on September 26th a Bulgarian delegation crossed over and requested a suspension of hostilities. This was rejected by General Franchet d'Esprey, the commander of the Allies armies. On the 28th he received another delegation, this time seeking an armistice, which he would negotiate with. On the 29th the armistice would be signed, and on the 30th it took effect, Bulgaria was out of the war. While losing an ally was bad enough, the removal of Bulgaria from the board also opened up other problems for the Germans. It meant that they might lose touch with the Romanian oil fields, which they were relying on as their sole source of oil. It also opened up the possibility of an advance of Allied troops into Austro-Hungarian territory which would then force the Austrians to abandon the Italian front, which would then lead to cascading problems that might push Austria-Hungary out of the war. Things were starting to close in on the Germans. Back in the west the German military leadership was on the brink of despair. There was news out of Austria-Hungary that the Hungarians were about to declare themselves an autonomous nation, and completely remove themselves from both the war and the empire. Other groups within Austria-Hungary were considering similar moves. Ludendorff had to tell the commanders at the front that there would be no more reserves, they had all the men that they would get and they would just have to make due. The allied attacks in Flanders really threw the German command into something akin to chaos. After hearing of the attacks Ludendorff would go into Hindenburg's officer at 6PM and tell him that an armistice had to be offered very soon. The German Foreign Minister Hintze made it clear to the military leadership that any offer of peace to the Allies would have to come with political reforms on the homefront. He knew that the allies would not accept the current German government, and so it was very important to start considering radical transformations on the home front. This was probably already going to happen due to the relations between the current German government and the socialists who were already pushing for change due to the war and the successes of the socialists in Russia. Most importantly out of all of these concerns, Hintze had serious doubts whether the monarchy, with the Kaiser at its head, could survive into the post war period. This meant either abdication or forced removal, a nigh unthinkable thought. An attempt to reach out to the allies did not hapepn at this point, but the groundwork was laid, and it would happen soon, but not before a few more Allied successes. On the very same day that Hintze was at Spa discussing the situation with Ludendorff and Hindenburg the Allies began their attack on the St. Quentin canal. The canal had been incorporate into the German defenses, and it made for a very imposing impression. it was 35 feet wide, with the Germans placing wire in the canal itself and on the banks coming back out, banks that were 10 feet high. The water was only about 8 feet deep but under it was mud that would swallow anything that fell within. It was a daunting task to try and get across, and for the most part the Allies would attempt to move around it. However, Rawlinson wanted to make an attempt to attack directly across. When General Monash, the leader of the Australian corps heard of these plans he believed that they were madness, but Rawlinson insited that the British troops give it a go. All along this part of the front the troops would benefit from a huge artillery barrage which would last for 3 days, which at this point in the war was far longer than normal, during this time they would fired 750,000 shells. More important the number of shells was the effect that they had. The British had complete and accurate plans for the defenses in this sector of the front. Way back during the Amiens attack a British tanker had captured a German Corps headquarters where not all of the papers had been destroyed. One of those papers contained plans for the defenses in this area of the front including every trench, dugout, and artillery position. It was a dream come true for the British planner, and especially the artillery. The attack would begin at 5:50AM on the 30th and the British troops on the southern end of the attack would reach the canal in about two and a half hours, some of them also captured an important bridge intact with others began the attempt to cross over the canal directly. To pretty much everyone's surprise these efforts were successful and things went very well for the British troops in this area. These attacks were mostly just supposed to tie down the German troops, with the real advances slated to the made by the combined Australian and American force to the north. Instead the British troops would make good time and by the middle of the afternoon they would advance 3 miles, capturing the primary German defensive positions. Once again the prisoner numbers were in the thousands, with the British troops taking about 5,000 of them. On October the 1st French attacks would take the city of St. Quentin while at the same time attacks continued all along the front. It would be hard fighting but the allies continued to grind their way forward. By October the third they had advanced all the way to the final line of defenes of the Hindenburg line which was called the Beaurevoir Line, the weakest of the German defenses. It was all that stood between the attacking troops and open country. It would be here that the attacks would begin to slow, due to the same logistical problems that we have been talking about for 174 episodes. Foch would be displeased by this development and would write to Petain that "Yesterday, 3 October...we witnessed a battle that was not commanded, a battle that was not pushed, and a battle that was not brought together...and in consequence a battle in which there was no exploitation of the results obtained"
While the situation seemed to be going fantastically for the Allies in the west, there were some cracks that were beginning to appear that would fully come to bear as October progressed. With the French having played such a large role in the fighting the Germans for the entire war, and then being so heavily featured during the fighting in the summer of 1918, their army was on its last legs. Their troops were exhausted, they were out of men, and their equipment had been heavily taxed when trying to get the Americans ready to fight. By the end September they were teetering on the edge of exhaustion and during October they were suffer a further 133,000 casualties. The British were having similar problems, some of their best troops, especially the Canadians, Anzacs, and the premier British divisions had been in almost constant action for months. The ANZAC corps had to be pulled off the line to get some rest, but it would never be enough. The British and Canadians were also having serious manpower problems, and were having to break up battalions to keep other up to strength. Such, the Allies were winning on the battlefield, but they were also running out of gas. The allies were hurting and exhausted, but the Germans were mortally wounded. Back on the home front Prince Max of Baden had been named chancellor after a near riot in the Reichstag. He was known for his liberal tendencies, and he fully believed that hostilities had to stop, and soon. Crown Prince Rupprecht would write to Max, completely bypassing Ludendorff, and say that an armistice had to be signed soon of the army would not be able to prevent an invasion of Germany. Ludendorff was actually saying much the same thing, insisting that speed was critical and that the army was falling apart. Prince Max, with a bit of foreshadowing of what would happen in the years to come, insisted that Hindenburg put down in writing that the army could not continue the fight. A note was started that would be sent not to the Allies but directly to President Wilson. They pinned many of their hopes on Wilson's 14 points, discussing items like peace without victory, and conceding to almost all of Wilson's demands. This was a haily mary, trying to get the best possible peace terms out of what had become a very bad situation. They also requested an immediate armistice, but they would not receive a positive responde. There was still more fighting, and more dying, that had to be done before the end. This will be our third and final episode about the American led Meuse-Argonne offensive. We will cover the entire month of October and then the beginning of November, right up to the armistice.